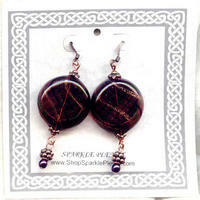 Rich amethyst hand blown murano glass discs measure about 25mm (a bit less than 1") in diameter, by 8mm thick. 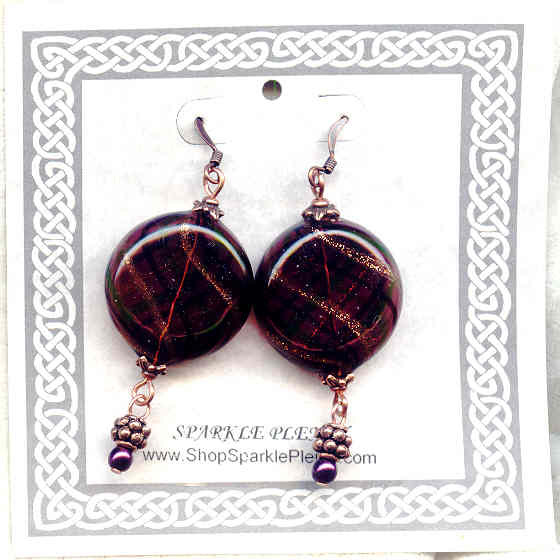 The beads have swirls of sparkling metallic copper, black and plum. The opulent look is completed with copper beadcaps and French hooks, and dangles of plum-coloured glass pearls and ornate copper beads. 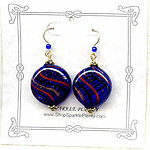 Once again, SPARKLE PLENTY brings you luxurious jewelry at an affordable price. Deep cobalt blue hand blown murano glass discs measure about 25mm (a bit less than 1") in diameter, by 8mm thick. The pendant has palest pink and lavender, and brighter yellows, shimmering enticingly against a butter yellow background.